The aims of the Society are to promote an interest in all matters relating to model railways and railways generally. It offers members the opportunity to build and operate model railways in cooperation with others, and provides premises where these aims and general social activity can be carried on. The Society consists of around thirty members; meeting on Wednesday evenings at the clubroom in South Croydon between 7.30 and 10.00 pm. Refreshments are available. A number of layouts have been constructed by members, which are displayed to the public from time to time at the Society’s annual exhibition or at exhibitions organised by other societies. The Society provides a newsletter to members, normally at two-monthly intervals. The Society has an email address for contacting the Officers and Committee. Our clubroom in South Croydon provides space for layouts to be constructed, stored and, depending on their size, to be operated. Unfortunately the space is not large enough for all the Society’s layouts to be assembled at the same time. A test track which caters for scales from N-gauge to O-gauge is always available to run locomotives. In the smaller scales DCC power is also provided as an option. Club nights provide an opportunity for members to meet, socialize and get a cup of coffee, but the room is available at any time by suitable arrangement. The Society was founded on 30th July 1947. The inaugural meeting was held at Purley Oaks School, South Croydon, when a committee was elected under the chairmanship of Mr F N Rush. 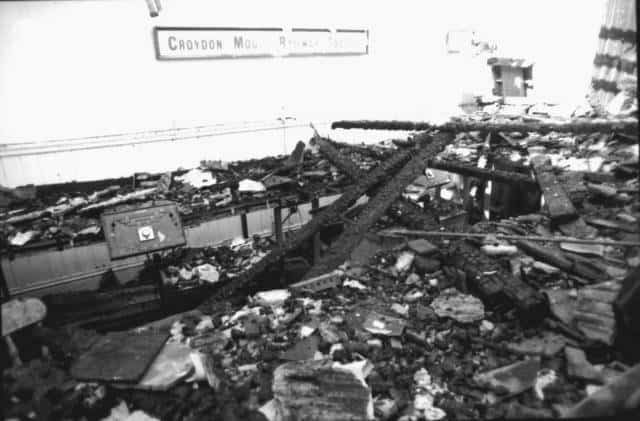 The Society moved into rooms on Platform 1 at Purley Oaks Station around 1950 and remained there until 2nd May 1989 when a disastrous fire destroyed the clubroom and its contents. Arrangements were then made for meetings to take place at Christchurch Hall, Brighton Road, Purley. This situation lasted until 22nd April 1992 when the transfer was signed for the purchase of the Society’s present clubroom in South Croydon. After a busy summer of building work, the Society moved in on 16th September that year. At last it was independent and in control of its own future. On a brighter note, we have discovered an old poster in an old club file. 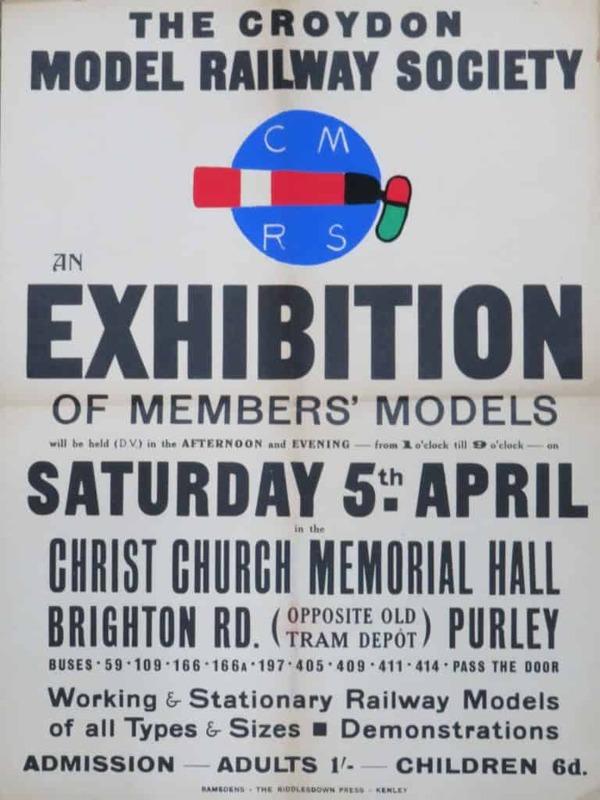 We are still trying to work out the date of this exhibition which we think must be in the 1950s or 1960s. If you can help us identify the year – that would be great. Last year, Hornby introduced the Lord Nelson to their catalogue. Back in 2012, some CMRS members saw the real thing, running on the Watercress line. This short video was taken at Ropley station.